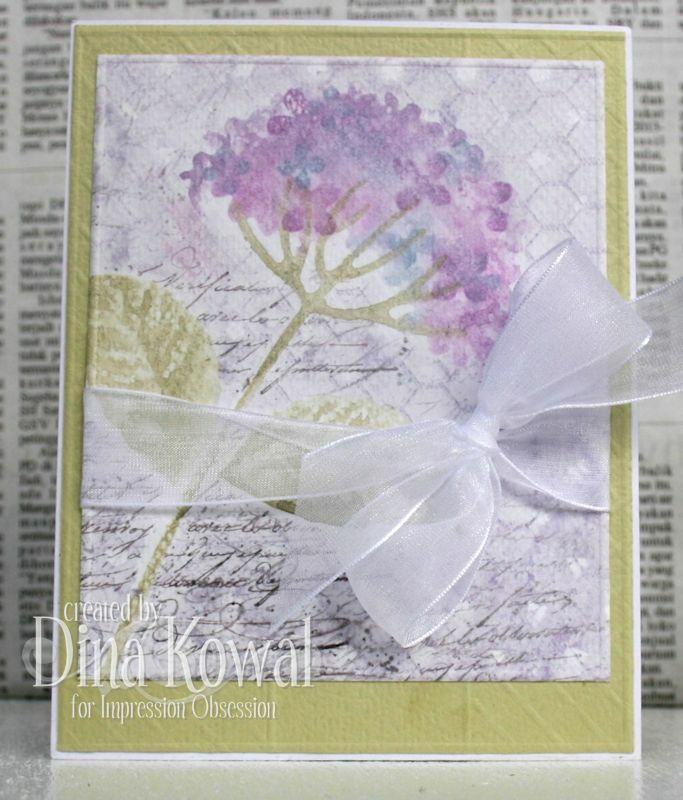 The Impression Obsession team's challenge today is to create a card with a floral theme. I made a fun collage card while I had my Hydrangea dies out a few weeks ago. I used diecuts to mask off the hydrangea stem, bloom, and leaves, then stamped the Chicken Wire and Reverse Polka-Dots backgrounds (inked with chalk ink then spritzed with water for a washed out watercolory effect). I also stamped the French Letter background in dye ink before lifting my masks. I don't think I have put that stamp away since I got it in December...! So great for a vintage background. I inked and spritzed the elements of the Hydrangea clear set with Versamagic chalk inks, for a faux watercolor look... on the flower area, I used a couple of different inks, then also stamped single flowers over the area while it was still wet. Dina @ Mama Dini's Stamperia ------- you are here!